Le Raison D'etre: Why this blog? Yes I know I owe you posts on my meals last week in Melbourne, and am furiously working on them. 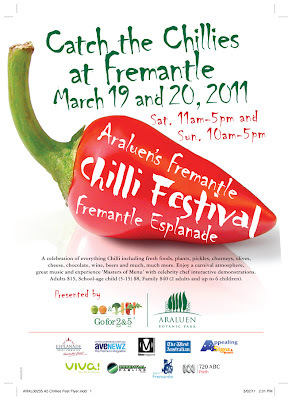 But in the meantime, don't forget to take some time off to visit Araluen's Fremantle Chilli Festival, located in the park just across the road from the Esplanade Hotel in Fremantle. This iconic chilli-fest promises to be an extremely hot, sweaty, even painful, endorphin pumped affair with hundreds of free tastings of chilli products. Chilli jam, chilli chutney, chilli dukkah, chilli paste, chilli curry, chilli beer, chilli everything! You can even buy chilli plants - I have 2 in my garden that I purchased a few years ago, and despite my green-thumb of death, they are still thriving today. I also believe that the hottest chilli in the world (which even gets the super hot habanero mewling like a kitten), the bhut jolokia, will be making a reappearance. There will be plenty of chilli-related foods for purchase too, and cooking demonstrations by a host of local chefs, live entertainment, and a licensed area offering, amongst other delights, Matso's Beer on tap. The Araluen Chilli Festival is the brainchild of Araluen Botanic Park Foundation Inc, a not for profit community organisation which runs the beautifully picturesque Araluen Botanic Park, nestled in a valley up in the Roleystone hills to the east of Perth. Originally staged in the Park itself, its popularity exploded to the point where it became the single biggest event in Roleystone every year, with around 5,000 visitors. Sadly, short sightedness resulted in a lack of local government support for this wildly successful event which also resulted in positive flow-on effects to local businesses. But this blog isn't about politics, so let's move on. 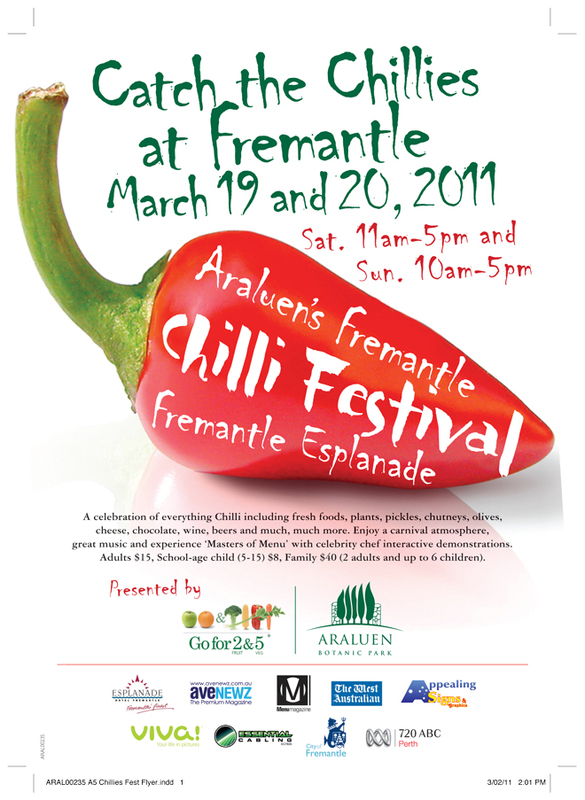 Happily, the City of Fremantle stepped in and offered the Araluen Chilli Festival a new home. Last year's inaugural Fremantle-based event attracted a massive 20,000 people across two days! Entry is an affordable $15 per person and $40 per family. Members of the Foundation get free entry. Pass-outs are allowed, so you can visit the stalls, pop across the road to quench the fire at Little Creatures Brewery, and pop back in. There's a 16-page liftout in the Thursday (17 March 2011) edition of The West Australian with all the details, but you really don't need to know any of it to head down to Fremantle this weekend and enjoy a lip-scorching, tongue-roasting, ring-burning (at least during the day after), experience. Update: a family pass allows entry to 2 adults and up to 6 children! The cheapest edible Chinese food in Perth! Food should be enjoyed holistically. Not just taste, but smell, texture, aesthetics, and even what you hear - whether it's a conversation, the lapping of waves, or a traffic jam in the background; and if you're lucky, what you feel in your soul - as Dennis Denuto noted: it's the vibe. It's not just any one thing that makes a great meal. Gnawing on an unknown but succulent meat on a stick purchased from a roadside vendor in a Hong Kong back-street can be just as exquisite as sitting down to an 8 course silver service degustation in an Italian Michelin-starred restaurant, provided you are in the requisite frame of mind. Copyright Melvin Yeo 2010. Ethereal theme. Powered by Blogger.